Stox, STX, was launched back on 05/08/2017 and operates without requiring a central bank or single administration. STX, a decentralized crypto coin, is not mineable, therefore in order to get STX, you can purchase with a currency exchange. 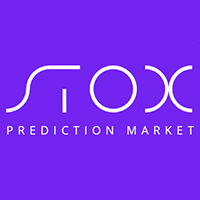 Stox can be found online, on social network sites like Reddit and Telegram. We don't have any wallets listed for Stox yet, check back soon! We don't have any debit cards listed for Stox (STX) yet, check back soon! We don't have any price charts listed for Stox yet, check back soon!